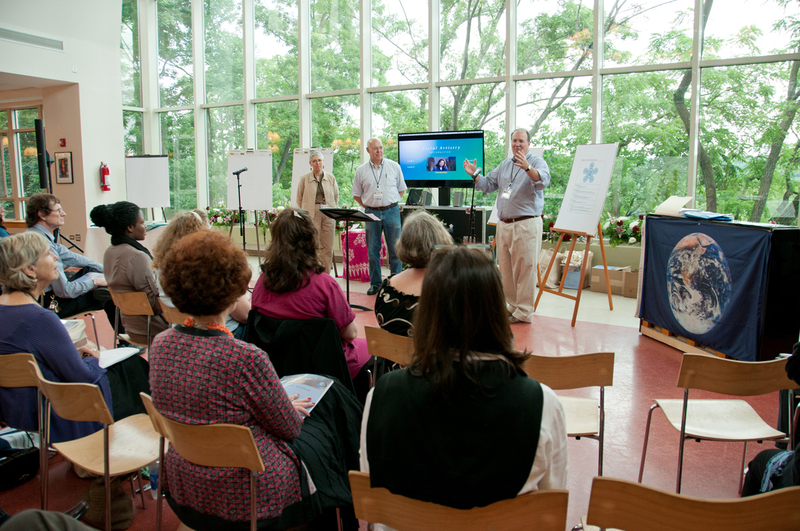 In June of 2012 and 2014 the Horace Mann School hosted the Conference: Re-imagining Education: The Teacher as Social Artist, a three-day introduction to Social Artistry designed specifically for members of school communities—teachers, administrators and school staff. Karen Johnson, Denise DiRenzo, Woody Howard, Gerry & Denise Dignan, and Paul Briggs were the faculty members for the 2014 Conference. Karen E. Johnson is an artist working in images and text. She is the Upper Division Photography Teacher and the faculty advisor to the photography publication, Insight, at Horace Mann School. Her involvement with Social Artistry began in 2006 when Woody and Karen attended the Social Artistry Leadership Intensive. Karen was a faculty member for the 2012 Social Artistry Train the Trainers program held in Colquitt, GA, and a regular participant and presenter at the annual Social Artistry Summit. In October 2013 Karen represented Horace Mann at The 8th Global Conference on Human Development held by The Institute of Cultural Affairs in Kathmandu, Nepal. She was a participant in the “Reshaping Education for the 21st Century” theme group. Karen is a Co-Chair of the Horace Mann Sustainability Committee. She is a mentor to “Emerging Leaders as Social Artists,” an initiative for 18-30 year olds. Karen has made a life-long commitment to participatory processes, inclusivity and social justice. Denise DiRenzo began her career as a Broadway performer, and a director/choreographer of theatrical productions in the US, Europe and Japan. In 2006, Denise became an ordained Interfaith Minister, and in 2007, she completed certifications in Professional Life Coaching and Empowerment Workshop Facilitation. Denise attended the Social Artistry Train the Trainers in February of 2013, in Colquitt, Georgia, and currently teaches Theatre and Dance at The Horace Mann School. Woody Howard has been the Chair of the Department of Theatre, Dance, and Film Studies at Horace Mann School for most of his 23 years of teaching. His involvement with Social Artistry began in 2006 when he and Karen Johnson attended the Social Artistry leadership Intensive in Ashland, Oregon led by Jean Houston. In the years since, Woody and Karen have initiated a number of projects at Horace Mann involving sustainability, institutional memory, and community building to name a few. He has revised many aspects of his teaching techniques in response to his work as a Social Artist. Woody believes in educating the mind, the body and the spirit of each student. He strives to be a part of the process of healing our world and restoring balance in our lives. Gerry & Denise Dignan have many years of experience helping to form learning communities through song and movement. Gerry is a professional musician who recently retired after teaching Spanish to 4th-8th graders. He performs as "Uncle Gerry" with the "Music Together" program. Gerry and Denise have been involved with Dr. Houston's work for fifteen years. Paul Briggs is a professional musician and sound technician. His business is known as DogEarProductions, LLC. Paul will be recording the conference sessions and providing music for various activities. Paul has recorded the Social Artistry Intensive programs since they began—for the past ten years and worked with Dr. Houston for 20 years. The conference was first envisioned in 2007 and evolved throughout the subsequent five years to become the first “Introduction to Social Artistry” designed specifically for school faculty, staff and administrators and the first to be sponsored by an educational institution. Drawing on the work of Dr. Houston and Dr. Howard Gardner’s Five Minds for the Future, among other sources, the conference supports participants in exploring and developing their human capacities and the social analysis and social capacities that can enable one to look afresh at curriculum, classroom dynamics, schools and the societal expectations and systems that impact the educational process. The attendees represented all educational levels from nursery years through college, and a range of disciplines including science, math, theater, dance, visual arts, marketing, English, environmental education, life skills, health and counseling, computer science and technology, library staff, foreign language and school staff and administration. Men and women, as well as younger to senior educators were represented. Faculty members from all 5 Divisions of Horace Mann, Pre-K through 12th and the Dorr Nature Lab attended the conference and others from all over the US—Chicago, Long Island, New York City, Arizona, upstate New York, New Jersey, Oregon, California and Georgia. One gentleman traveled from Nepal to attend the 2014 conference. Without exception the participants were bright, open, enthusiastic and creative. I can say without hesitation that it was one of the best designed, thoughtfully researched, professionally presented, and innovative workshops I have experienced. The content was relevant to every aspect of the life of the School, every discipline and every office in the School that exists to support our collective efforts to nurture “great and giving lives” in our students. I felt that I regained new energy, not only physically but spiritually as well.... I feel I can make a significant difference in my teaching, school, and community with my new desire, hope, energy, and tools that I acquired from this conference. I felt that singing and dancing together brought us—all 50 unique individuals—together as one. ... (and) made me forget my age—freedom within the structure! Singing and dancing together created a joyful feeling among our group of strangers. It was the perfect way for us to feel comfortable with one and other. The exercise of deep listening and imagining taught me how to be more receptive to others and how to expand my mind. It made me want to try it with family and friends. I especially enjoyed the walk in silence around the campus. A walk I take most days turned into a journey of exploration of sky, shapes, colors, sounds, textures and feelings. For the first time, I noticed objects I had never seen before yet have always been there. The pacing of the days worked well. Shifting from sitting and listening to speakers to actively dancing and singing kept everyone “on their toes”. Please watch for future opportunities to participate in Re-Imagining Education: The Teacher as Social Artist conferences.